Only a home with an effective roofing system can truly guarantee comfort, protection, and peace of mind. In the absence of quality roofs, vulnerability of homes from harsh weather and fire is increased. Fortunately, specialists in home building and constructing materials turn their attention to metal roofs, which is preferred both in residential and high-rise commercial buildings due to its durability, non-combustibility, portability, recyclability, ease of installation and cost-effectiveness. The durability of metal roofing is attributed both to its protective corrosion-resistant coating, such as zinc and aluminum, and its inherent nature to reflect radiant light. The environmentally green benefits of metal roofing. Metal roofing is environmentally friendly, energy efficient and green. Steel products have the highest recycling rate, by far, of all the recycled materials. Studies have shown that the recovery rate for steel is around 90% and is easily separated from other materials by using magnets at recycling plants and waste disposal sites. All new steel is made with 30% recycled steel and less energy is used to extrude this material than that used to extrude natural iron or other natural materials. Steel can be recycled over and over increasing it’s lifespan and decreasing it’s impact on the environment. Metal roofing is a strong, durable and cost effective material that suits many building designs and roofing applications. 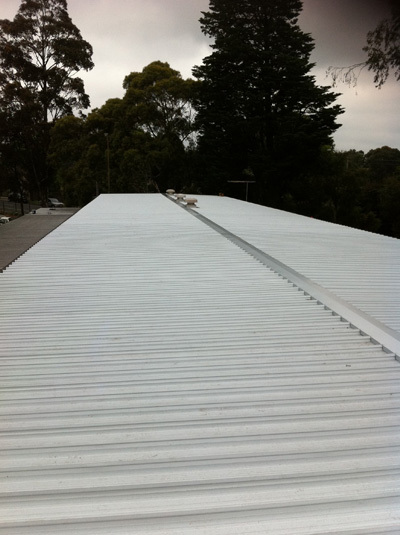 It comes in a wide range of colour choices backed by Bluescope Steel warranties. Skylights and whirlybirds are available in all styles and sizes.